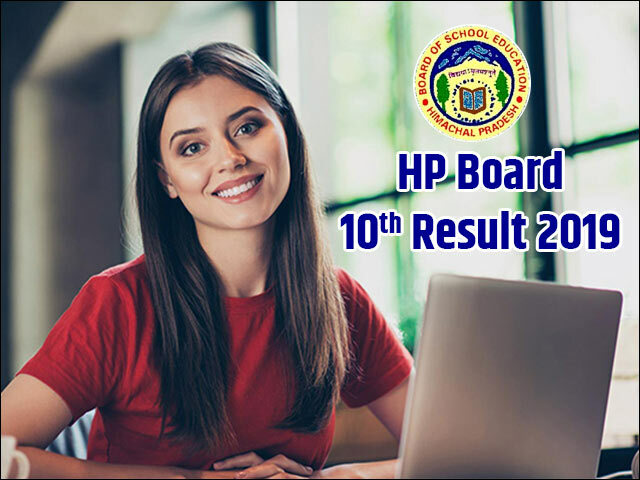 HP Board 10th Result 2019 - Himachal Pradesh Board of School Education (HPBOSE) will declare the HP Board 10th Result 2019. Apart from being a conducting body, the board also declared HPBOSE 10th Result 2019 and HPBOSE 12th Result 2019. The HP Board 10th Result 2019 will be announced for only those candidates who will appear for the board exams in the coming month. Currently the HP Board has not yet declared an official date for the availability of the HPBOSE 10th Result 2019; nevertheless, the HP Board has made available the date sheet of the 10th board exams. As per the timetable, the HP Board 10th exams 2019 will start from March 7, onwards, and will end on March 20, 2019. Last year the HPBOSE 10th Result was declared on May 3, following this trend we can expect the HP Board 10th Result 2019 to be out in the first week of May, 2019. The result will be made available on the official website of the board- hpbose.org; apart from this students will also be able to access their HP Board Result 2019 Class 10 on this page. We at JagranJosh will be updating this article with all the latest news and developments pertaining to the HP Board 10th Result 2019. Students can bookmark this page for easy access to the result without missing out on any important aspect of the HP Board exam. As of now, the HP board has not yet released any official notification about the declaration of the results. The students who are appearing for the examination should concentrate on their studies and the updates regarding the results will be posted on this website. Hence, we request all the students to bookmark this page to stay updated regarding the examination news. How to check HP Board 10th Result 2019? The result of HPBOSE 10th Result 2019 will be made available online on the official website of the board. Students will also be able to access their HP Board 10th Result 2019 from this page as well. We will activate the link in this article when the result is announced in May. Students are advised to check the official scorecard from reliable sources only. To avoid last minute rush, students are recommended to bookmark this page and get access to the HPBOSE 10th Result 2019. It is prudent to wait for the official notification or announcement from the Himachal Pradesh Board of School Education regarding the HPBOSE Result. Finding relevant and regular updates on HPBOSE Result 2019 is a tough task. Keeping this in mind, we would be providing all important news and updates regarding HPBOSE 10th Result 2019 here on this page. The analysis of HP Board Result 2019 will be done after the results are declared in May. With tension rising among the students, a simple way to calm the nerves would be to look at the result stats of last year. This data will help the students understand the strictness and evaluation standards followed by the examiners to check the answer sheets. It also helps students build right and realistic expectations with regards to HPBOSE 10th Result 2019. For this purpose, we have provided the key statistics of previous year’s HP Board Result 2019 below. What after HP Board 10th Result 2019? After the HPBOSE Result 2019 is announced, the first thing to do is check the HPBOSE 10th Result 2019. Students should download their HP Board Result 2019 once they are available here in this article or from the Boards’ official website. These can be used at the time of admission process in the colleges and schools and are considered as provisional until the originals are submitted for verification. However, the students must also remember to collect the original scorecards from their respective schools as a printed or downloaded copy of the HP Board 10th Result 2019 will not be accepted as an officially valid document. In case the students find any discrepancy in their mark sheets they should connect to their concerned institution. There may also be cases where a student unfortunately fails in the exams. Such a student will be provided with another opportunity to prove himself/herself. The student will be able to appear for the compartmental/ supplementary exam. The supplementary examination may be scheduled to take place in the month of June. The same will be notified here in this article and also by the board on their official website. Students are advised to bookmark this page for any update on the HP Board Result 2019; they can also fill in their details on the link shared in this article to receive notification in regards to the HPBOSE 10th Results 2019. The Himachal Pradesh Board of School Education has been in existence since 1969 and was established under Himachal Pradesh Act No. 14 of 1968. The HPBOSE was initially located at Shimla, which was later shifted to Dharamshala in January 1983. Despite the tough terrain of the state, the board has more than 8,000 affiliated schools and additionally has more than 1,650 examination centres in the state. The Himachal Pradesh Board of School Education has also established 19 information centres, book depots to provide required educational resources to the students. The Himachal Pradesh Board of School Education regulates affiliated schools and conducts board examinations for more than 3 lakh students at both the SSC and the HSC level. Apart from the board examinations to regulate and access the competency level of its academic staff, it conducts J.B.T and T.T.C examinations too. The HPBOSE Result 2018 for Class 10th has been declared on the official website, i.e. hpbose.org. The Himachal Board has announced the HPBOSE Class 10 Results 2018 today. The scorecards are now available on the board website i.e. hpbose.org. The Himachal Pradesh Board 2018 Matric or Class 10th Examination for the regular students has begun. The HPBOSE 10th Result 2017 has been announced by the Himachal Pradesh Board of School Education (HPBOSE). The HP Board Class 10 Result 2017 was announced from Dharamshala office the board. Students can now check the HPBOSE Results 2017 online on hpbose.org. The Himachal Pradesh Board of School Education (HPBOSE) announces the HPBOSE 10th Result 2017. The HP Board Result 2017 for class 10 students is now available online on the official website hpbose.org. HP Board 10th Date Sheet 2017 has been officially announced. Get the full HP Board 10th Class Time Table 2017 here. Breaking news From The Himachal Pradesh Board of School Education (HPBOSE) : Dharmshala Results for HPBOSE 10th result today at around 11am in the morning. Candidates can check the result at http://hp10.jagranjosh.com, hpbose.org and hpresults.nic.in. HPBOSE 10th Result 2016 has been recalled by the board today. As per official reports, the HP 10th Result 2016 will be republished soon. Students can check our dedicated result portal hp10.jagranjosh.com for the new date and time of HPBOSE Result.